Today I want to write about a beautiful pigeon that is surprisingly large, the Victoria crowned pigeon. These large, beautful pigeons grow up to 74 cm long, which is the size of a turkey, making them the largest species of pigeon in the world. Victoria crowned pigeons spend most of their time in small groups on the ground, looking for fallen fruit, seeds and insects to eat. They only fly into trees when they feel threatened or to sleep at night. The males become very aggressive towards each other during the mating season and show off their beautiful feathers to the females by dancing around and bobbing their heads. They also make very loud booming calls. They mate for life, looking after their single egg and chick together. 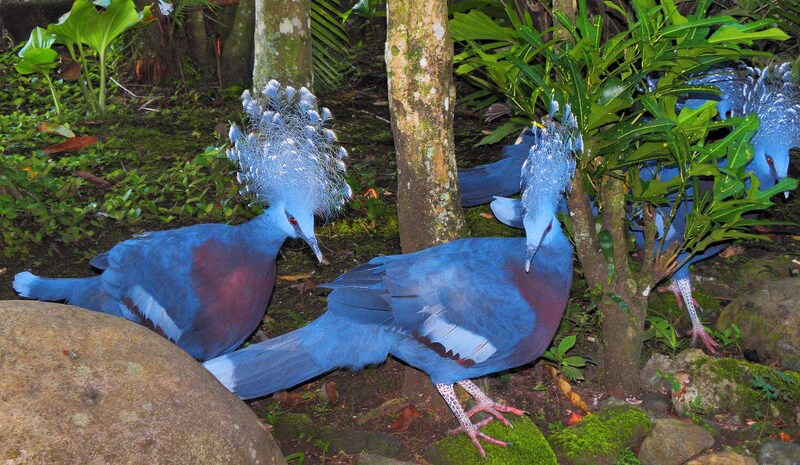 Victoria crowned pigeons are found in the forests of northern New Guinea and are considered near threatened due to habitat loss, poaching for the pet trade and hunting for food and their beautiful feathers. Are there any other interesting facts that you would like to share about Victoria crowned pigeons? Thank you for the pic and info; they are amazing, it seems almost impossible that they could be a natural species.